My name is Jonathan. This is my first year working as an aerial observer on the New England Aquarium's right whale research project. I came to the Aquarium over a year ago as an intern and was able to get my feet wet last August when I worked on the Bay of Fundy project - which you will be able to read about in our Blog coming this summer! The aerial survey project is very different from the Bay of Fundy project. For starters, we are in a plane instead of on a boat. As you can see from our photo, the plane is not very large. It seats four people, two pilots and two observers. The observers each have specific responsibilities depending on which seat they sit in, right or left. The observer in the right seat is the photographer, because we always circle clockwise. The observer in the left seat is the data recorder and the liaison between the plane and the ground contact. This is sometimes deemed a challenge, especially on days when we have 44 whales! Both observers usually share the radio responsibilities. As Monica mentioned, this blog is new to us and took longer than expected to get it up and running. During the month of February, we were really busy documenting as much as 44 whales in our survey area in one day! You can imagine with such a large amount of whales cavorting in such a small, high traffic area that we had our work cut out for us. February was not our only busy month. So far, March has also been exciting and edifying. I can remember on the first of March, Kara Mahoney and I sighted our 18th known mother with her calf for the first time this season. 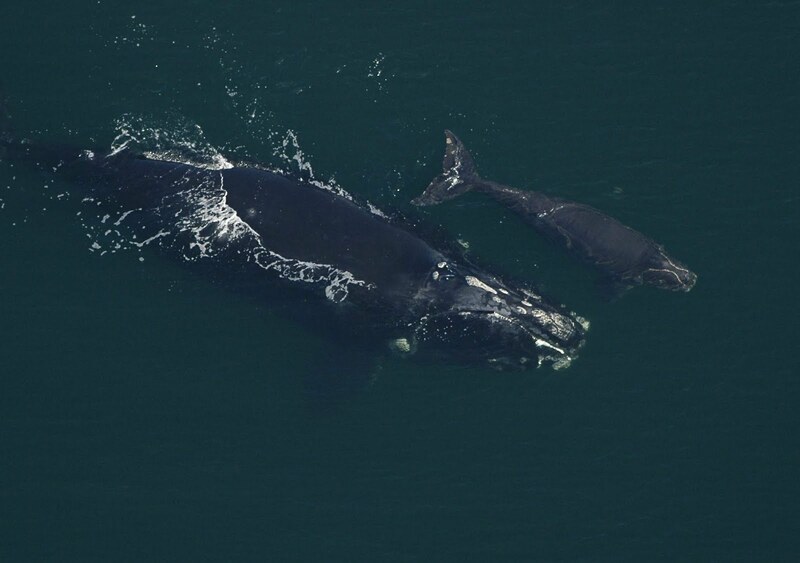 The mom is an eight-year-old female, known in the right whale catalog as Eg #3020. It is often times difficult to identify whales from the plane because we are circling around them at an altitude of 1,000 feet and a speed of 100 knots; as you can imagine it can be a little bumpy. We originally thought #3020 was an already known mother this season (Eg #2040), but were skeptical once we saw how small her calf looked from the photos that Kara took. While we were circling over #3020, we saw a disturbance in the water that we call "funny whale water" (When right whales disrupt the surface tension of the water they agitate the water in such a way that can be seen with a trained eye). We left the area and circled over the "funny whale water". While we were circling, I noticed an integrated tug and barge heading right towards where we sighted #3020. Knowing how critical the timing is in these situations I asked the pilots to put me on marine band radio. Using Automated Information Systems (AIS), I was able to get the name of the tug and barge and immediately radioed the captain. By this time the pilots took action, returning to #3020's location and were circling overhead. The captain responded promptly and in one lengthy breath, I informed him that there were two right whales two nautical miles off his bow and he was in a direct route towards them. He acknowledged the position and altered his course without hesitation. The timely response from both the tug and barge and the aerial survey team is a prime example of how commercial operators and researchers can work together to help preserve a critically endangered species. My name is Monica Zani and I have been flying right whale aerial surveys for 8 years and managing the New England Aquarium's winter team for 5 of those years. We got a late start on this blog and have been in the field here in Fernandina Beach for 3 months. I will attempt to bring you up to speed on the developments of this years winter calving season. This December proved to be a typical December with many days of flying and only a few sightings of whales. January was a month of so much wind, fog and rain that the survey team was unable to fly almost half of the month. We began February with high hopes of good weather and lots of whales, and February did not disappoint! 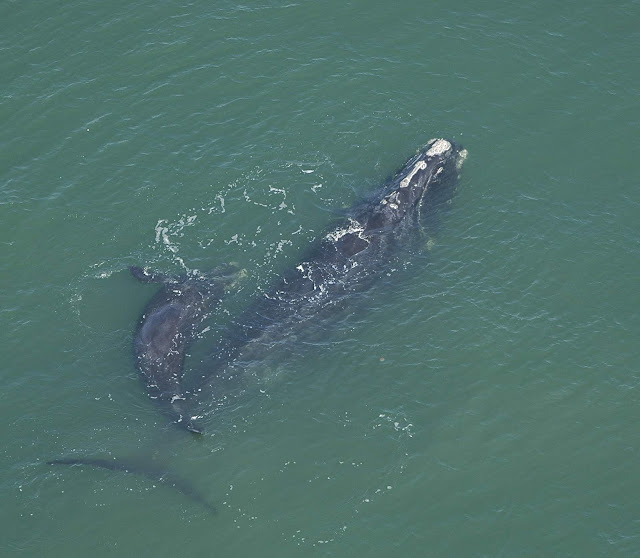 We have flown almost every day in February and have had some amazing weather for sighting right whales. When the team spots a whale it is reported directly from the plane to a ground contact via a satellite phone. The ground contact immediately goes to work entering the whale's position into a large email network that sends an alert across a system of pagers, email and as text messages on cell phones. The whale information is sent directly to some shipping companies, the Navy, the USCG, dredges working local channels and harbor pilots from Charleston to Cape Canaveral. Information is sent to the private boater via the USCG Broadcast Notice to Mariners every hour. 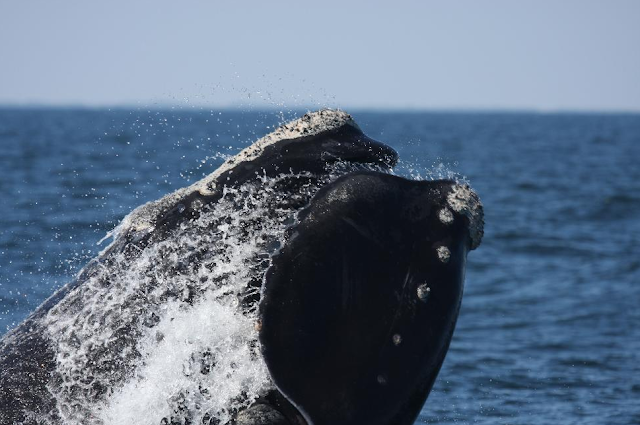 The information is also entered into the Mandatory Ship Reporting System (MSR) so that all inbound shipping traffic will know the exact locations of all right whales sightings in the last 48 hours. So far this season has been incredibly busy with many whales in the coastal waters of Georgia and northeast Florida. So far this season has produced 18 mother/calf pairs (calf production has ranged from a low of zero to a high of 31 over the past 25 years)! Unfortunately, we believe at least four calves have died so far this winter A number of whales (many of them juveniles) have kept the survey team busy on a day-to-day basis. Each morning we look forward to getting back in the air. We look forward to seeing whales and perhaps a new calf, but most importantly we hope that the long work hours are helping to protect right whales in our survey area. 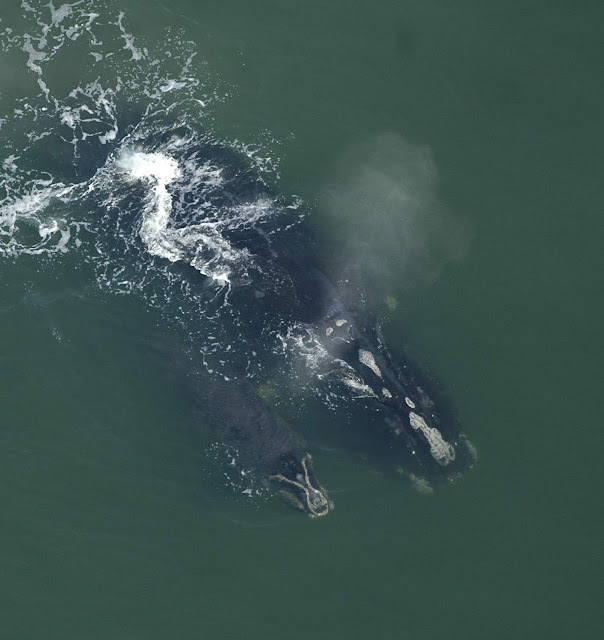 We hope to provide you with an update on our surveys and the activities of the right whales in the southeast critical habitat a few times a week. Please stay tuned and check back often for our updates.